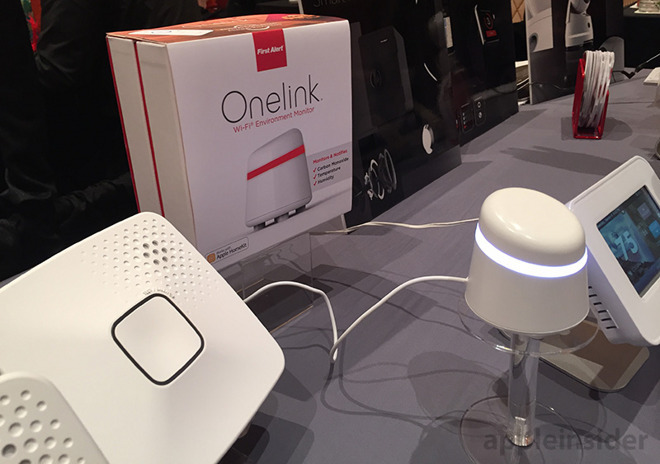 First Alert showed off a handful of Wi-Fi-connected Onelink products at CES Showstoppers on Wednesday, including HomeKit-enabled devices like a safe, smoke and carbon monoxide alarm, indoor environment monitor, smart thermostat and, curiously, a camera. The most interesting of the company's new devices is one we know the least about. Set upon a simple stand, and bearing First Alert branding, the Onelink camera does not yet have an official name, but promises a number of industry firsts including a contactless respiratory monitoring feature that tracks a sleeping user's breathing in real time. 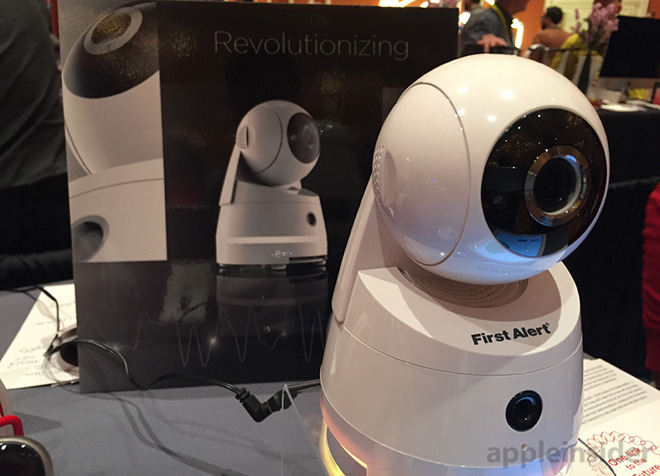 Interestingly, First Alert presented the motion-sensing, pan/tilt camera alongside devices made to work with HomeKit. Apple has yet to authorize IP cameras for integration with its smart home protocol, though that could change. First Alert declined to comment on the matter. In theory, a HomeKit-enabled camera would be able to alert users when it detects dangerous changes in breathing rate, low temperatures or the presence of low-level carbon monoxide by triggering other devices, such as a house alarm or room lights. In addition, HomeKit offers easy hardware provisioning and ensures video data transfer is protected, a key feature missing from many IP cameras. When the unnamed camera launches, it will do so as an advanced baby monitor. Applying a proprietary software algorithm to the camera's 1080p video feed, First Alert was able to engineer a system so sensitive that it can detect a baby's breathing from across the room. The company was quite hesitant to reveal how exactly the technology works, but suffice it to say that it does and there was a working sample on display at CES to prove it. In addition to babies, First Alert's tech is a good fit for those diagnosed with sleep apnea. Users can access a real time waveform readout of their breathing from an accompanying app, or check the previous night's sleep the next day. 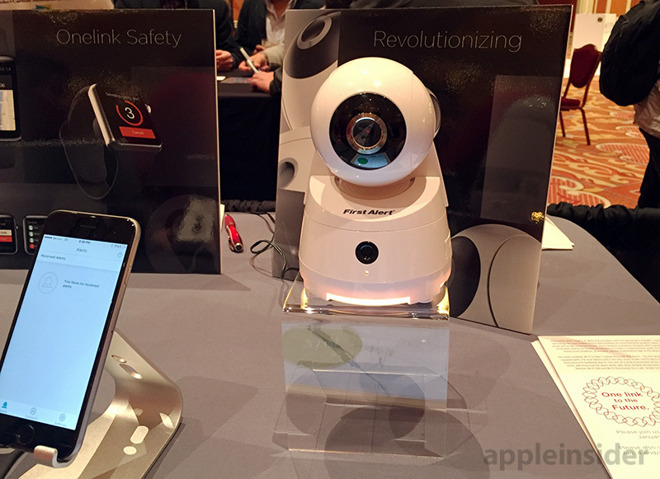 First Alert plans to put its Onelink camera on store shelves by the end of 2016. 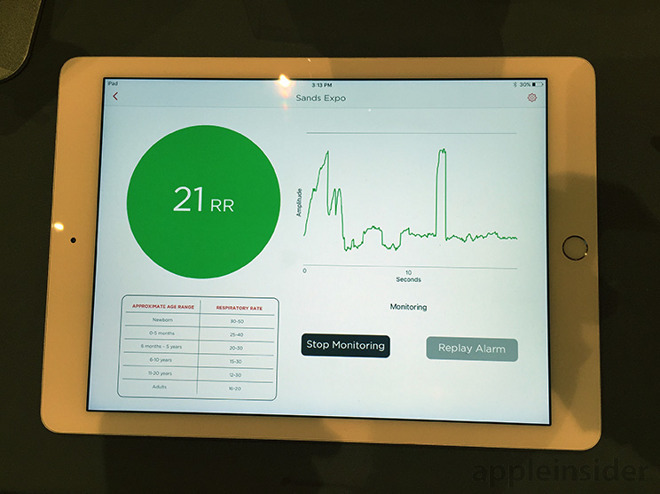 An official HomeKit-enabled product at First Alert's booth was a Wi-Fi connected safe for storing valuables. Available in two sizes, the unit is fire resistant, waterproof and can be bolted to the floor for extra security. The safe connects to an iPhone, iPad or iPod touch via Wi-Fi, or Bluetooth in case of a power outage. This means users can remotely unlock the safe via Siri, assign passkeys to others and monitor usage from afar. An accelerometer detects motion and sends out an alert when triggered. The First Alert Wi-Fi Environment Monitor is a plug-in unit capable of tracking temperature and humidity, as well as identifying and alerting users when low level carbon monoxide is detected. A translucent LED ring lights up white when conditions are normal, blue when temperatures are too cold, yellow for too hot and red for carbon monoxide. 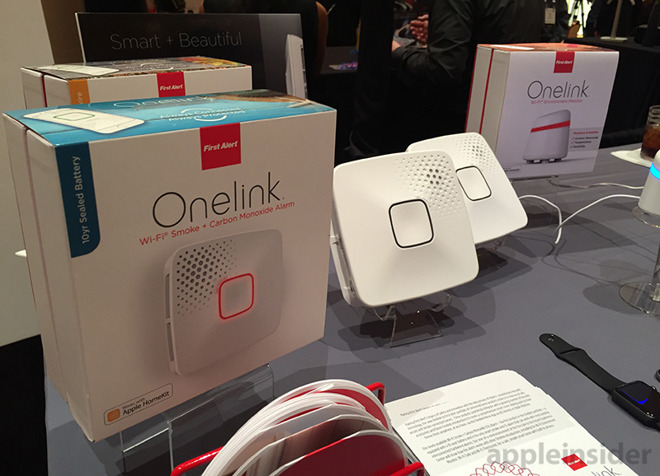 Along with an internal alarm, the device sends out push notifications and integrates with other HomeKit hardware. First Alert expects the unit to go on sale this spring for $100. Working in tandem with the Wi-Fi Environment Monitor is the Onelink Wi-Fi Smoke and Carbon Monoxide Alarm. Compatible with HomeKit, First Alert's alarm is designed to integrate with multiple units in a single home, meaning that all alarms sound when smoke or carbon monoxide is detected. A voice function informs users of the type and location of danger. The alarm features Wi-Fi and Bluetooth connectivity, Siri voice control for testing and alert silencing, push notifications and a ten-year sealed battery (also available in a hardwired version). The unit is available now for $104 from Amazon.com. 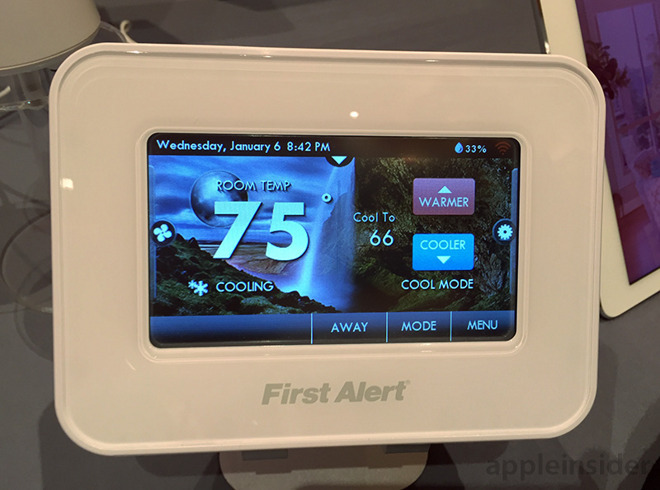 Finally, First Alert's Wi-Fi connected, full color, touchscreen smart thermostat will be updated with HomeKit compatibility. The unit is expected to ship in spring for $250.